Analysts seemed to have looked at the Dow Industrials (DOW) in every way imaginable, trying to eke out additional profits. The Dow components are an interesting group because they have extraordinary liquidity. At the same time, they are “mature” companies. Wisdom says that mature companies are unlikely to grow as fast as newer companies, which have unique products and more available market share to capture. Or so we thought. Sometimes we draw conclusions without all the facts. Other times we decide, in advance, that the gain probably won’t be worth the effort. I would have felt the same way, except that I was curious as to whether buying or selling the strongest DOW components, and simultaneously doing the opposite with the weakest, would yield an interesting result. I like this simple approach to arbitrage because it should reduce risk more than it reduces returns. Along the way, I also took a look at some of the established strategies for the DOW, and discovered the truth about them. The period evaluated is from 2004 through March 2017. While the DOW can be traced back more than 100 years, my feeling is that results from 2004 are more relevant now. Myth: Large companies can’t grow at the same rate as smaller or newer companies. This is a difficult statement to generalize because some smaller companies can post great returns or they can fail. Instead, we’ll compare the 30 DOW stocks with the rest of the S&P 500 (Figure 1 left). 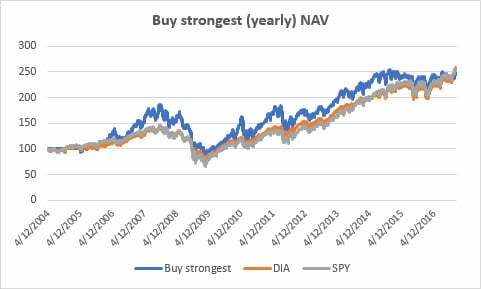 When adjusted to 100 at the beginning of 2004, both the DIA and SPY ETFs performed nearly the same. In Figure 1 (right), we can see that the DOW stocks represent about 25% of the S&P total capitalization, which still leaves enough room to separate the performance of one index from the other. 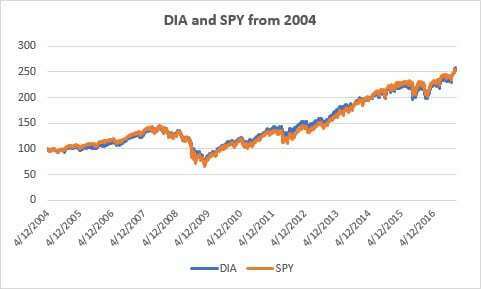 Figure 1 (Top) Returns of the DIA and SPY from 2004. 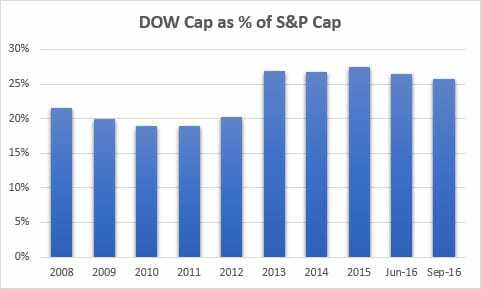 (Bottom) Percentage of DOW to S&P total capitalization by year. Our conclusion is that big companies can perform as well as smaller ones. Of course, it doesn’t hurt that Apple is part of the DOW, and that some smaller companies can implode, but if we allow exceptions to every rule, there is no way to draw any rational conclusion. The Dogs of the DOW was popularized by Michael O’Higgins in Beating the Dow (1992). In those rules, you bought the 10 highest yielding Dow stocks on January 1 and held them for the rest of the year. For the period 1973 through 1989, that method would have beaten the average return of the Dow by 6.8% per annum. However, in 2017, the current thinking is that high yields mean low returns. After all, why pay shareholders a high yield when the stock is soaring, like Apple? We’ll use the concept that a high yield generally means lower returns, and take an easier path analyzing the Dow. The Dow members are all substantial companies. When they want to attract more buyers they raise dividends. They are always trying to improve their market share by introducing new products or some new innovation. For those reasons, it is possible that the worst Dow stocks might rotate upwards in their returns. Figure 2 show the results of buying the 10 Dow components with the worst returns, then rebalancing annually (actually, every 252 days). Based on a $200,000 investment, each stock is allocated $20,000 and the position size is $20,000 divided by the price at the beginning of each year, a simple way to get volatility parity. Figure 2. 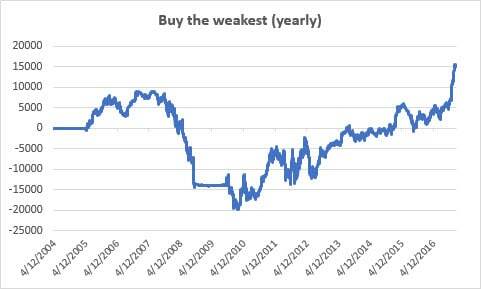 Buying the weakest Dow components every 252 days. The chart shows a drawdown of about $30,000, or 15%, from 2008 through 2010, far less than the drawdown of the whole market. Otherwise, the net return was only slightly more than $15,000. We can calculate the simple return as $15,000/200,000 divided by 12 years, or about 62 basis points (6/10ths of 1 percent each year. Not a return we would like but could be useful when viewed as a hedge. If we look back at the results of DIA and SPY in Figure 1, we show DIA with a return of 7.65% and an annualized volatlity of 17.8%, and SPY with a return of 7.55% with an annualized volatility of 19.1%. I like using reward to risk ratios, and DIA is 0.429 while SPY is 0.395. Both are far better than buying the 10 worse performers of the Dow. While we can’t speak for the past, this period shows once a dog, always a dog. Most of us have figured out that a high-quality antique or painting is more likely to appreciate in value than a “bargain.” Buying a Da Vinci oil is going to be a better investment than buying a portfolio of Da Vinci ink sketches. The high-end appreciates faster (and is more volatile) than the low-end. If we buy the strongest of the Dow components, rather than the weakest, we get returns that are much more attractive, and slightly better than either the full Dow or the S&P. In Figure 3 (left) the rebalancing is done yearly, and on the right, the rebalancing is monthly. The yearly rebalancing shows more volatility and a flattening of returns during the past three years. Using a faster, monthly rebalancing, returns far exceed both DIA and SPY, but with a slightly larger drawdown during the financial crisis of 2008. 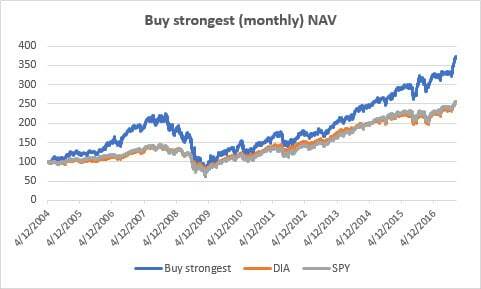 Figure 3 (Top) Buying the strongest 10 Dow stocks, rebalancing yearly. (Bottom) Buying the strongest 10, rebalancing monthly. These results shouldn’t be a surprise. Stocks that are performing well most often continue to perform well. The idea that a price is technically “overbought” and should be sold, is nonsense. Look at Apple or Amazon or Tesla. The biggest winners defy fundamental analysis, except in retrospect. A relative-value arbitrage takes advantage of divergence in prices of two related markets. Given two stocks in the same industry, one stock is relatively strong and the other is relatively weak. This often happens when, for example, one retail company releases good earnings a week before a competitor. The stock of the first company jumps while the other lags, for lack of news. A typical arbitrage is to sell the first and buy the second, assuming that the earnings announcement of the second will also be good and it will close the gap. But the companies in the Dow are not in the same business, so they have no reason to move together. They would only be similar in that they reflect the price reaction to the general economy. Given a ranking of stocks by historic performance, if we believe that the stocks that are outperforming can’t be sustained, then we can sell the best and buy the worst. But then we would always lose money because the top stocks would continue to outperform and the bottom would likely continue to have the same problems that pushed them to those level. The worst stocks might not even be moving, so they wouldn’t provide much of an arbitrage, only a waste of resources. We are then left with the conclusion that the best performing stocks are most likely to continue to outperform. That means the worst performers are not doing as well. We’ll base our strategy on buying the 10 best Dow stocks, evaluated using a 23-day (about 1 month) rolling linear regression of returns. We’ll rebalance every two weeks. Having settled on the stock selection, we now want to reduce the drawdowns. We’ve already changed the rebalance period from monthly to every two weeks, which makes us more responsive to change. We still evaluate the price performance using 23 days. 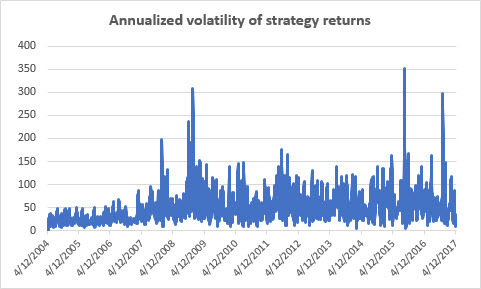 If we plot the daily returns of our strategy (not the prices), we can get the 20-day annualized volatility, the rolling standard deviation of the daily returns times the square root of 252, shown in Figure 4. Figure 4. Annualized volatility of returns for the strategy that buys the strongest 10 Dow stocks using a 23-day linear regression. We take risk seriously, and the simplest way to reduce risk and avoid unnecessary losses is to deleverage when risk gets extreme. In this case, we define that level at 90. Then whenever we are rebalancing (every two weeks), we reduce our position by 50% if the annualized volatility is greater than 90. When volatility drops below 90, we reset our full position on a rebalance day. We can do more. Because we have 50% of our investment available above our volatility threshold, we can now go short the 10 worst performers in the Dow at the same time we reduce long positions. We don’t know that these worst performers will move in the opposite direction, but we do know that they will underperform. In fact, the combination of reducing position size using volatility, and hedging at the same time using available funds, gives the performance in Figure 5. The final method has a return of 15.7%, a volatility of 24.28%, and a return to risk ratio of 0.646. That’s twice the return with a ratio about 50% better. It doesn’t eliminate the drawdown during the 2008 financial crisis, but it shows good overall stability. Figure 5. 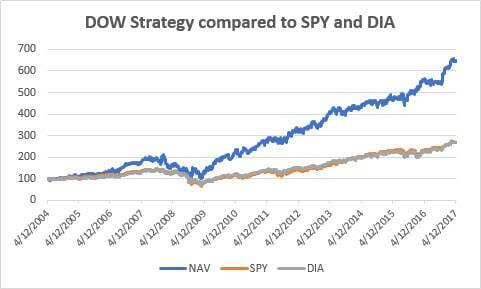 Results of the Dow strategy compared to SPY and DIA. A strategic or tactical approach to investing doesn’t need to be complicated to be good and it doesn’t need to use obscure markets or chase the latest fad. Active management can generate the same returns as passive investing with half the risk. It’s your money.